If you think of IKEA only as a place to get lost and then end up spending way more money than you meant to, you should start thinking outside of the flat-pack cardboard box. That's what senior citizens in Shanghai are doing, and, according to the Wall Street Journal, they've managed to turn their local IKEA into a hot spot for meeting potential love interests. I make more senior citizen friends when I come here. There's more to offer than meeting a boyfriend at IKEA. They sit for hours in the cafeteria, leaving behind orange peels and egg shells they have picked off boiled eggs brought from home. Occasionally, security guards intervene to try to keep order. Young people, often with kids in tow, plop on chairs to watch videos on their smartphones. People aren't shy about kicking off their shoes and tucking into display beds for a nap. I can't say I'd find it relaxing to sit among the screaming children and exhausted shoppers at my local IKEA cafeteria, and the idea of crawling around on public sheets just paralyzes me with fear of bringing home bedbugs, but I guess I can see the appeal of having a comfy chair to hang out in if you get sick of shopping. Still, even though it's kind of IKEA's fault for being so damn appealing in the first place, all of this hanging out has become quite a problem for the store's managers. Your behavior is affecting the normal operations of the IKEA cafeteria. 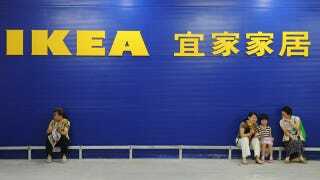 Frequent fights and arguments do serious harm to the image both of Shanghai residents and IKEA. Bringing in outside food and tea violates the cafeteria's regulations…If you are a member of this group, we feel we have warned you, do not use the resources of IKEA to organize events of this kind. Unfortunately the sign has had little effect because management hasn't been able to find a leader of the group with whom they can negotiate. Damn, it's like Occupy IKEA over there! Anyway, it seems like overall IKEA has been more than accommodating. Perhaps the giant blue box of a store cannot bear to be responsible for breaking the heart of Qian Weizhong, a retired chiropractor who showed up at a recent gathering looking to get the number of a gal he called a "nice lady" so he could ask her out. Let's hope she says yes, and then let's keep our fingers crossed that they head home after their date—and not to a bedroom display at their favorite IKEA.